You will love the HS700 FPV drone. And by that, we mean you will love everything about it, from the packaging to the way it flies. 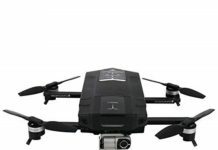 Holy Stone HS700 FPV Drone is referred to as the HS flagship. You will see just why in this short review. Ok, the drone body is made of plastic. Wait, before you turn up your nose and say, “harrumph! Another plastic drone!”, this does not feel cheap-plasticky at all. Besides, with all the works – the lights in the front and under the drone, flight speed and many more, you will hardly notice the plastic. Built by Chinese company Holy Stone, this drone inherits all the remarkable qualities that this brand is best known for. 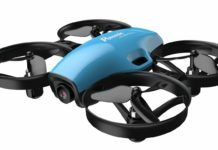 Whether you are a drone expert or you are just beginning your journey in the world of drones, the Holy Stone HS700 FPV drone is packed with a wide range of features. All these ensure that every drone enthusiast regardless of their level of experience enjoys flying it. Back to the body … you will see that it comes with a compact body that can endure crashes and other abuses that are common with beginners. This is a camera drone. You will also love the fact that it is able to capture excellent quality images that you can view real time. But enough of the sneak peeks; here is a more detailed Holy Stone HS700 FPV Drone review. 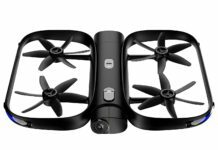 The physical features – This drone comes in a lightweight design since it only weighs 608 grams, which makes it quite convenient for travelling. It measures 8.7 by 8.7 inches, which makes it ideal for flying only an open space as opposed to smaller indoor spaces. Every part of this drone is well built, and the drone is sturdy, and long lasting. The drone however does not come with protection guards and thus the pilot should always keep some distance when operating the drone. When you get the package, confirm that it includes a transmitter, a camera, a battery, charging cables, a battery charging bag, 8 propellers, 2x landing gear, a screwdriver and a user manual. 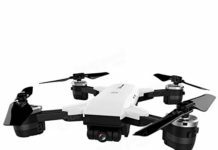 Camera – Among the features that makes the Holy Stone HS700 FPV drone to stand out from the competition is its camera. It is equipped with an advanced 5G 1080P FHD camera that is able to capture awesome still photos as well as shoot videos of excellent quality. The camera uses upgraded lens that have a 110 degrees field of view, which provides a panoramic view for capturing all of your memorable moments. In addition, the camera offers a First Person View (FPV) function that provides you with a continuous real time video and image transmission on your smartphone. With FPV, when the drone is flying, you will get a view as you would if you were right inside the drone. This drone is also compatible with GroPro 2/3/4 cameras, which are all easy to install or remove. Battery – The Holy Stone HS700 FPV drone is powered by a large 2800mAh battery. The battery provides up to 20 minutes of flight time in calm conditions or when flying it indoors. In windy conditions outdoors, you will most likely get less than 20 minutes of flight time per charge. However, you can say this is a very fair deal considering that many other drones in the market have an average of about 8 minutes of flight time. The battery comes with a charge transfer box, a balance charger, USB charging cables and a battery charging cable. The battery takes about 5 to 7 hours to charge fully. If you would love to increase the flight time, just get a couple of extra batteries. Image transmission and storage – The drone’s 1080p HD Camera is equipped with a 5G transmission function that ensures you enjoy clear live image and video transmission. For your image and video storage space, the camera has a pre-installed 8GB memory card. If you wish to boost the storage space, you can install a memory card with a bigger space. Safety features – Since this drone is GPS enabled, it is able to automatically return home to the take off point when the battery starts to run out of power. When it loses connection such as when you accidentally fly the drone out of range, it will turn back to the place that it flew from or to the person holding the controller. You can enjoy flying your drone without being worried that it will crash if the battery is drained. With GPS connection, you do not need to worry that it might get lost in case it flies out or range. Flight – The HS700 drone come with various flight features that ensure that you enjoy flying your drone in the easiest way possible. It is fitted with a durable 1500KV brushless motor that enables the drone to do a noiseless, yet more powerful flight. If you know motors, then you will agree that a brushless motor has more advantages over a brushed one. This drone can attain a maximum speed of 25 km/h when flying upwind and 60km/h downwind. The drone is equipped with GPS. This enables you to locate drone’s flight location in real time. The GPS Follow Me flight mode allows the drone to automatically follow the pilot. In addition, the pilot can customize the flight path when using the App. With the App, you can just draw your flight route of choice on the screen and the drone will fly along that particular route. The drone also has headless mode that enables you to easily control its direction. 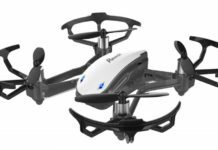 Generally, flying this drone is quite simple courtesy of its simple controls and quick release propellers that do not require screws to be set up. The controller – The controller is highly responsive, easy to use, sleek and good looking. It has a phone holder too. If the drone loses signal and cannot stream video, the controller remains connected. The controller also has a small LCD screen where you can see the battery stats, flight height and distance (position of the drone) as well as the number of satellites that you are connected to. Having been one of the very first people to buy this drone when it came out, I almost bought a different drone, but I am now so glad I did not. From the moment I received the package, I have been wowed out of my wits. This is a big drone (will require to be registered with the FAA) and many incredible features. Adlyn N.
I love the obvious thoughtfulness that went into the design and engineering of this drone. 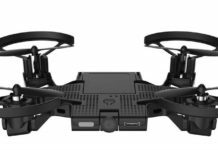 From the controller alone, you will see things like battery life, positioning of the drone, how many satellites you are connected to and other features on the LCD screen. I think I will stay a long time without upgrading on this drone. Michelle W.
At last, a drone that packs a decent flight time in the battery. I have tested the Holy Stone HS700 on family videos and photo moments and I think I am ready to take it out for professional videography. With such an advanced camera and the long flight time, I feel this drone can do anything. Richie L.
I have been looking for a drone that I can use for business and for fun and I think with the HS700, my search is over. I am yet to test it outdoors, but from what I have seen it do indoors in a big school hall, I am sure I made the right decision. Jim H.
Everything about this drone spells class and durability. The blades look hardy and good, the body feels quite strong although it is made of plastic. Havi M.
Who Should Buy Holy Stone HS700 FPV? The HS700 is ideal for any drone enthusiast who would love to have an easy time flying the drone. 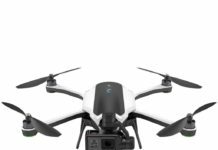 If you are a beginner and you would love a drone that you will not have to upgrade on anytime soon, buy this one. The robust construction ensures that it is able to withstand abuse as you learn how to fly. 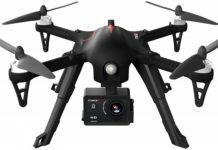 You can also buy this drone to use it for professional video and photo work. You can look forward to reliable and robust construction, incredible performance and a reasonable price when you buy the Holy Stone HS700 Drone. This drone has many impressive qualities that make it worth every coin you spend on it. 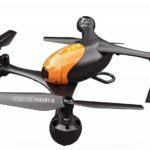 If you are a drone enthusiast, this is just the perfect drone that you need to start enjoying the aerial videos and photography. Just buy an extra battery or two and you can increase the flight time considerably to be able to do all of your video and photo work.